Several years ago, I had the privilege of working on-board the 147m/482 ft Saudi Royal family yacht the “Prince Abdul Aziz.” It was a first-hand experience with the wealthy 1% and was quite an eye-opener. A typical day with its owners consisted of shopping at Gucci, LV, Hermes and Bulgari when we made port regardless of location in the Western Mediterranean region. The 25K euro daily average shopping splurge prompted the support staff to purchase large suitcases or trunks to be used as temporary storage. Not surprisingly, given the situation among visiting VIPs and royalty, this was the norm. Given my professional métier in luxury brand management, I realized that this target audience belonged to a category distinct from any other which are labelled as the One Percenters. The frequent conspicuous consumption was considered a normal occurrence for the Royalty and its VIP guests as were the elaborate prepared meals devoured that would make the mainstream cringe. Who on earth are the one percenters? – Have explored plenty more in their lives due to their significant disposable income/wealth. When the premium plumbing brand, The Kohler Company, introduced the ultimate toilet fit for the well-heeled, it developed a contemporary industrial design that would make Apple glow with envy. Numi, as the model was baptized, includes technology and engineering that is unconventional with most toilets as we know them. Its features include, amongst others, ambient lighting, a bidet, foot warmers, a seat warmer, music, lighting, and hands-free flushing – which are all controlled through a remote which, with a press of a button, also lifts and lowers the lid. All this can be had for a mere $6500. Luxury purveyors who aspire to cater to the top tier of spenders should have a mission, vision and a sound implementation strategy to reach this elite demographic target ‒ short of simultaneously pursuing the aspirational consumers who are prone to cutting back when the economy takes a dive. This latter group of consumers dilutes the cachet of the brand and can turn out less profitable in the long run. Moreover, the HNWI/UHNWI frown upon offerings which are accessible to the mainstream as they desire status and exclusivity. LVMH Moët Hennessy ‒ Louis Vuitton S.A (French conglomerate that owns a legion of luxury brands including Louis Vuitton, Marc Jacobs, Fendi, TAG Heuer, and Dior cosmetics among many others and in various categories), Chanel, Hermes, PPR/Kering (owns controlling shares of Gucci and Yves Saint Laurent, among others), Richemont (owns the prestigious Alfred Dunhill, Cartier and Montblanc brands along with many others), Rolls Royce Motors, Bentley Motors, Bugatti Motors, Rolex, Patek Philippe, Goldman Sachs, Gulfstream, Sotheby’s, Bulgari, Tiffany & Co., and Harry Winston to name a few. Luxury service brands follow a similar pattern. Consider American Express − most notably for its “by invitation only” Black/Centurion card. For hotels, worthwhile mentions are the Hotel Plaza Athenée, the Four Seasons (including its private jet tours), the Ritz Carlton, and boutique hotels Hotel du Cap and Hotel de Crillon to name a few prominent ones. They splurge and provide the perfect luxury experience with outstanding service, exclusivity, and pedigree. Studies over the years have shown that the HNWIs/UHNWIs travel frequently and usually do so on a private jet. It’s also a fact that emerging markets from commodity rich countries such as Brazil, Russia, India and China, have a tremendous amount of new ultra wealthy citizens that can’t be ignored. Reaching them is not easy. However, following are several approaches the prestigious luxury brands are utilizing. – Sponsor and/or advertise where the HNWI/UHNWI meet and play such as prestigious golf clubs, polo events etc. Rolex supports prestigious sporting and cultural events all over the world including tennis, the arts, golf tournaments and yachting. – Advertise in private jet terminals worldwide called Fixed Base Operators (FBOs) ‒ facilities that handle non-scheduled flights. One such opportunity is in Davos (Switzerland), towards the end of January, where the World Economic Forum is held. There are also magazines, such as “Privat Air” which are published specifically for private jet travelers. In 2012, there were over six million private jet flights. It is, undoubtedly, a targeted audience where one reaches the ultra-wealthy family together – which may be discussing a product or service you may be offering. 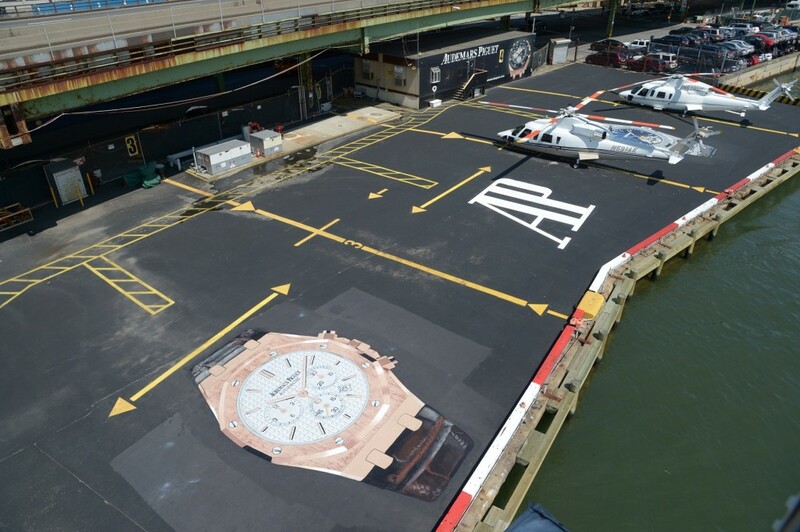 Swiss watchmaker Audemars Piguet had several helipads with their logo located on Manhattan’s 34th Street. The helipads included paintings of their watches which functioned as landing markers. – Meet and woo its discerning target customers at high profile industry shows and events. Burgess Yachts, for example, participates at the annual Super Yacht Show in Monaco which draws the well-heeled shopping for a multi-million dollar yacht. – Advertise and contribute content in prestigious lifestyle magazines which cater to the ultra-affluent including Amex’s ‘Departures’ magazine, ‘Worth’, ‘Elite Traveler’, ‘Monocle’ and ‘Burgess’ amongst others. – It goes without saying that successful brands have an online presence/visibility including a clean looking and engaging website, along with a carefully targeted social media existence to build long term online awareness, loyalty and value for the brand. Along with what the prestigious brands are doing to attract the top spenders, consider creating an exclusive/”members only” online club/site. Moreover, if you’re offering products, boasting about artistic development by engaging with them and encouraging a visit to your atelier to witness your product being crafted. Videos should also be considered for viewing online. Research where the wealthy neighborhoods are worldwide by using demographic data. This information reveals everything from median income and age, educational levels and consumption statistics. Demographic data also helps improve target marketing and advertising. Sell a distinct lifestyle which is what discerning clients look for. Be in the forefront of creativity and have all your staff, regardless of department/responsibility, as your brand ambassadors. Occasionally, organize exclusive “by invitation” events as a patron appreciation gesture. Being invited to an exclusive event makes one feel notable. For example, Italian sports automaker Maserati invited a select number of brand loyalists to a new experience in Europe that gave them the opportunity to sail on-board the 70 ft./21,3 m Maserati sailboat. In addition, they drove models in its current range including the new Maserati Gran Turismo Sport model. Create/publish an upscale lifestyle magazine, every other month or quarter, which should include noteworthy information on the brand and the arts, as well as the causes it supports – in an environmentally friendly print format, along with a digital version. The Bentley motors magazine is a good case in point. The layout, choice of articles/stories and advertisers reflect the tastes of its existing and potential customers. Corporate Social Responsibility or CSR, along with sustainability issues, is a trend increasingly practiced in the luxury domain to send a message to their audience that they it cares. This is communicated through sponsorships, advertising, public relations, their websites and other media sources. The message conveyed is to enjoy guilt-free ostentatious purchases where part of the purchase price is donated to a worthwhile cause. Louis Vuitton uses celebrities in its advertising campaigns whose fee goes to charity. In the United States, the top 1% possess 40% of the wealth; it owns half of all the stocks, bonds and mutual funds.